You see that spot on her cheek? That’s one of them! As a parent, having a sick child is the worst. No matter the age, it breaks your heart into a million pieces and even more when there is nothing you can do about it. 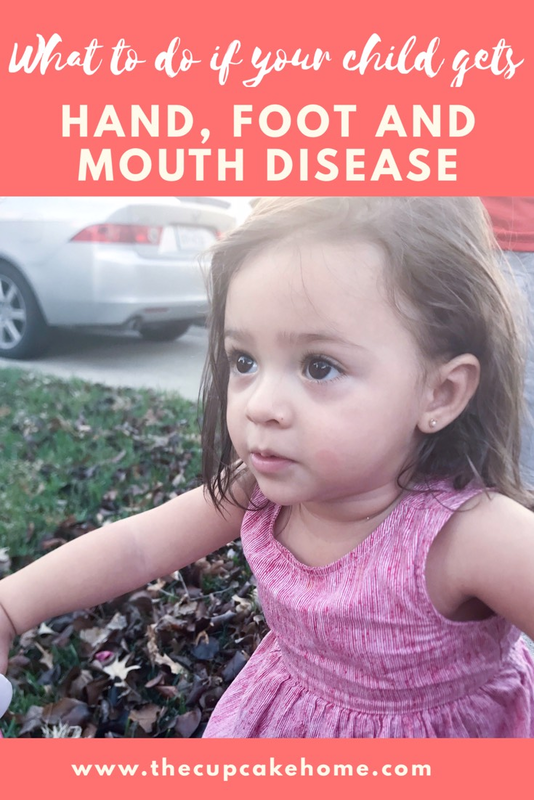 Last December Bella got hand, foot and mouth disease (HFM), and I would probably go ahead and say this is the worst sickness known to a healthy child. Everything hurts, itches and eating normal food is not an option yet you are healthy and no medicine is prescribed. Bella got it right in between Christmas and New Years and it was the worst for both her and us. The thing with HFM is that no medicine is actually given. It’s one of those things where you just have to let it run its course, meanwhile, this disease gets worse before it gets better. It appears as innocent spots and before you know your child is completely covered. Now, there are cases where the child doesn’t even seem to bother by it and others where it gets very bad. With Bella, it began with a fever, a fever that seemed to have no limit (104.9). We took her to the ER and after waiting 3 hours without seeing a doctor we took her to the next best thing, an Urgent Care clinic. Once the doctor saw her and spotted 3 red dots on her stomach she knew right off the bat. Within a few hours, she was completely covered and the worst part began. Her fever continued, the crying started and she began to feel very, very uncomfortable. The worst part was that every time we touched her it seemed to bother her more and more, yet she wanted to be carried and held tightly. After 3 days the worst seemed to be behind us and Bella began acting normal, but her spots continued to appear and did so for about 4 more days. She was able to eat a little better and the itching stopped. Her spots started disappearing 2 weeks in and by 4 weeks they were completely gone, and to say I was relieved doesn’t come close to reality. As the season of HFM circles back around we are taking every precaution possible to avoid it happening again, and I want to share with you how we are doing it and also a few tips that can help if your child already has it. To prevent it is pretty simple, yet even more simple to catch. – Wash hands after being in any public setting, specially splash pads and parks. Remember that germs reproduce in hot areas. This may be anywhere! Our daughter caught it from her cousins at my mom’s house. – Use a lot of disinfectants. We carry a bottle of this in the car and always have Baby Ganics in our diaper bag. Bella loves this one as is a foam. – Ask your doctor for a prescription mix of Benadryl and Maalox. This was our saving grace. This allowed Bella to sleep, eat and be a bit happier for a while. I was honestly afraid to give it to her since is does have Benadryl, but according to our doctor (and the web of doctors, if you know what I mean), the amount of Benadryl is lower than the recommended dose going by your child’s’ age. – Pick up at your local pharmacy (or you can always order it online here) Calamine Lotion and feel free to spread it as much as possible. This helped Bella with the healing, scarring, and ITCHING! – This is the time to spoil them! Give them lots of TLC. Like I stated above, doctors don’t give medicine for this so only our love can make them feel better. – To avoid any scratching we used cotton these PJs. – Squeezy pops, Outshine fruit bars anything and everything cold. Hope these tips help, but as always if you have any further questions feel free to email me! This is helpful to me because my little girl has never had it- but I'm sure she will someday! Poor girl! This is all really great information, thank you! Ohhh I can only imagine how hard this was for you and of course Bella herself. It's so hard to see our little sick specially when we have nothing to give to make them feel better.